We interact with people constantly: random strangers, family, friends, clients, customers, colleagues, our bosses, and more. In the majority of those interactions, understanding who we are, and who they are, can make a huge difference to the relationships we develop, how effectively we communicate, and what outcomes we realise. We’ve all met people that we instantly like, or dislike; and we’ve all worked with people we get on well with, or can’t get on with at all. Why is that? as a mechanical-engineer, manufacturing precision automated machine-tools, was very different to many of the sorts of jobs that exist today. Back then, the output of my effort was primarily mine alone. Even though I did complex technical work, I operated largely independently, and work-related interactions were mainly limited to my line manager, or socially with my work mates. Back then, that was the case for most of the jobs in the organisation at that time. …is very different for almost everyone, regardless of their position, or what industry sector they are based. For a start, work is largely knowledge based now. It’s more complex, dynamic, uncertain, and fast moving. It’s often poorly specified, has unclear objectives, and requires problem-solving activities that depend on intensive collaboration between large numbers of people, many of whom may not have met and who could be located anywhere in the world. Similarly, the organisations in which we work today are also very different. Globalisation has spurred fragmentation, outsourcing, and distributed functions and operating sites across multiple geographic locations (60% to 80% of all employees may now be working in distributed, cross-functional virtual teams), increasing work team diversity well beyond the more obvious ways in which we are differ from each other. Business functions are organised around Communities of Practice, each having their own sub-culture, language, jargon, idiosyncratic personality types and behaviours, e.g. IT, Actuaries, Lawyers, Sales, etc…, along with the sub-functions within each. Management structures have de-layered and are flatter and wider than they were in the past. This increases spans of control for leadership, and necessitates a broader range and greater volume of interactions between all collaborating colleagues. Indeed, over the last twenty years, the time spent collaborating has ballooned by more than 50%, challenging people to keep up while doing their day jobs. Furthermore, Matrix-management structures result in us having multiple bosses with both direct and ‘matrixed’ reporting lines; and we are involved in multiple teams at the same time, each with competing pressures for our time and resources (65% and 95% of knowledge workers participate in multiple teams simultaneously). These circumstances, and the work-based context they create (uncertainty, constant change, competing pressures, interpersonal and goal conflict…) generate extraordinary levels of stress, corresponding with the generally declining levels of mental health concerns being reported (i.e. anxiety, depression, etc). It’s ironic. At a time when our success increasingly relies on consistent and effective pro-social behaviour, and inter-personal skills have become the most crucial of capabilities, these stressors make us behave in ways that are counter-productive, and often self-destructive. Knowing yourself, and better understanding those you come into contact with has never been more important. Apparently, not very well at all! 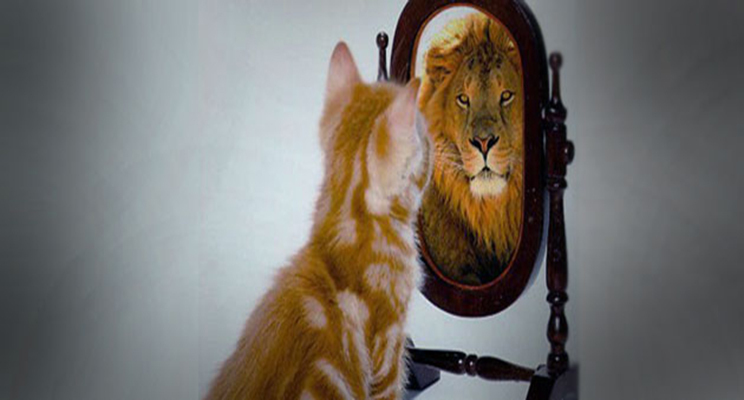 A recent five-year research study found that although 95% of people believe they are self-aware, only 10% to 15% actually are! I was exposed to personality assessment at an early stage in my career. It’s what triggered my interest in Personality Psychology, 25 years ago. Despite a long period of learning, I’ve only relatively recently been able to say that I know myself well – after years of study and intensive Doctoral research! Most people don’t make that amount of effort. Personality Psychology is esoteric, even within the frothy field of Psychology. Making sense of the research relating personality is like putting together a million piece jigsaw when you’ve been given two-million pieces and an unclear picture to work with. It’s not surprising that this is the domain of specialists, and a challenge faced by those specialists is to find ever better ways to share that understanding with those that need it – everybody else! In the mean time, the resulting lack of awareness of the underlying frameworks that define our personality has a profound impact on our lives – personal and professional – and on the lives of those we come into contact with. For example, in the workplace, a lack of awareness about personality can lead to poor organisation design, ineffective team composition, counter-productive behaviour and/or unproductive conflict, each of which can result in dramatic performance loss. In our personal lives it can lead us to make poor life-choices, inappropriate partner choices, behave anti-socially, be the targets of abusive relationships, result in relationship and/or marital failure, addictions, substance abuse, risk-taking, negative health outcomes (physical and mental) and reduced life-expectancy. Well, unless you have a good understanding of your personality, and the ‘human condition’more generally, you can’t begin to understand the range of potential behaviours you are predisposed to, or the triggers for those behaviours. Neither are you in a position to try to change those trait related behaviours, should you want to (and more than 87% of us DO want to change some aspect of our personality). Equally, it makes it impossible to understand the huge diversity in differences between individuals, when choosing mates, or working with collaborating teams within large organisations. How and when are we supposed to learn these lessons? There are obvious ethical and practical challenges with mass personality assessment of school children and young adults. Consequently, the only assessment done relates to academic attainment and progress against the curriculum. However, this is contrary to the universal wisdom that prevention is better than cure, it means that important learning opportunities at key life-stages are lost; and it means that the primary responsibility for nurturing is on parents who, in the majority of cases, are likely to be ill informed and unprepared themselves. Is this knowledge expected to somehow become apparent to us as we assume our position in adult society, and enter the world of work? Doing jobs we hate, and aren’t suited for, and having to deal with the associated stress. Or working closely with people in jobs they hate – and dealing with the consequences of that. Smart, caring, educated professionals who are unaware that their children have developmental learning difficulties, or other forms of maladjusted personality traits. Reputable private schools that provide a life-changing lack of pastoral care to high functioning students with learning, emotional, or behavioural difficulties – at key stages in their lives. Professionals who, having achieved success, fail to recognise and manage the negative aspects of their personality and derail themselves while negatively impacting others in the process. Individuals that reach mid-life before identifying they have challenges associated with facets of Autism, and/or other maladjusted traits. Millions of individuals going through difficult marital/relationship breakdowns and dealing with the associated emotional, psychological and financial costs (in most cases, wondering how they got into those relationships in the first place). No doubt everybody has similar examples. To help with understanding, the following is a simplistic explanation of Personality, and one particular model of Personality – The Five Factor Model (FFM). The intention is to generally increase awareness about the influence of personality, your own, and that of the people you come into regular contact with. Future articles will explain the issues more fully, and there are plenty of them! Is understanding Personality important, if so, why? Yes it is important, and as I’ve already suggested, unless you are aware of your personality, you won’t understand: the range of your behaviours (at ‘normal’ times and when we are stressed), the triggers for those behaviours, the behaviours of that difficult individual you have to work with, how best to approach them, or how to compose a team for optimal performance. Neither are you in a position to try to change them and more than 87% of us want to change some aspect of our personality. Trait A – Individuals that are high in this trait are at double the risk of premature death compared to individuals who are low in this trait. Among those treated for cancer, individuals with higher levels of this trait have a 130% greater death rate than those lower in this trait. People with a high level of this trait are sick more often, take more time off work, are more susceptible to stress (and have lower stress tolerance) and burnout, have disrupted sleep, are less satisfied with life, suffer with social impairment, relationship breakdowns, and conflict. People with low levels of this trait do not perform well on challenging tasks that are constantly changing, or uncertain – which describes much of the work we all have to do today. Trait B – People with a low level of this trait do not work well in noisy environments where there are lots of distractions – such as open plan offices – especially when their work is routine and not very stimulating. People with high levels of this trait are more likely to be promiscuous and unfaithful in a relationship; they are not best suited to jobs that require long periods of concentration; their performance dramatically declines when they are sleep deprived, or jet lagged, and they generally perform better later in the day than they do in the morning. However, they can improve that performance with caffeine. Do you find it impossible to start work without a strong coffee? Now you know it may be personality related! Trait C – Individuals with high levels of this trait are more prone to substance abuse and illicit drug taking. They tend to be more intelligent and health conscious, are great problem solvers, and perform well in team settings. Individuals with low levels of this trait are more likely to be over-weight, unhealthy and unfit; they are creatures of habit, and are very resistant to change of any kind. Trait D – Just one team member with a very low level of this trait will severely negatively impact the social cohesion in a team, and facets of this trait are associated with conflict and anti-social / aggressive behaviour. Conversely, people with very high levels of this trait will not function well in tough leadership roles, or roles requiring difficult decisions, and/or hard-nosed negotiations. Trait E – Individuals with very high levels of this trait will be rigid and resistant to change. They will be inflexible, prone to unusual obsessive and/or compulsive behaviour, may be difficult to work with, and intolerant of others that don’t share their trait strength. People with very low levels of this trait are unreliable, unpredictable, have poor general health, they tend to be over-weight and unfit, and they take more time off work than those with higher levels of this trait. More simply, what this means is that behaviour is reflective of our personality and, in order to practically define what we mean by ‘personality’, we describe it in terms of personality traits, which have been defined and rigorously statistically validated in useable scales. We do this so we can consistently know, with a high degree of confidence, that a person with a particular personality profile will be predisposed to behave in a way that’s predictable – most of the time! We are very complex and there are many facets to our personality. Consequently, there are lots of different models of personality, and associated personality scales. For example, The Five Factor Model (FFM), sometimes referred to as The Big Five, is the most widely researched and validated model of Personality in existence. That reliability is important in a work setting if you want to understand how individuals will behave in a given work situation. 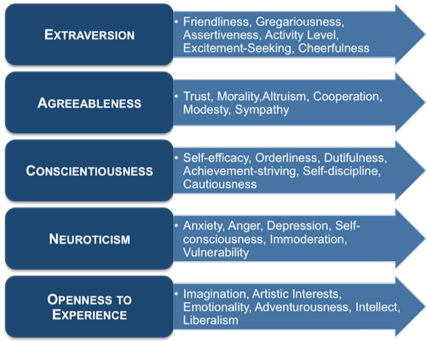 The FFM shown in the adjacent diagram includes the traits: Extraversion, Agreeableness, Conscientiousness, Emotional Stability (Neuroticism), and Openness to Experience. It also reflects the ways each of these traits are typically characterised. The Big Five personality traits are assessed on a continuous scale ranging from low to high, whereby the strength, or magnitude, of each trait predisposes individual’s typical behaviours. 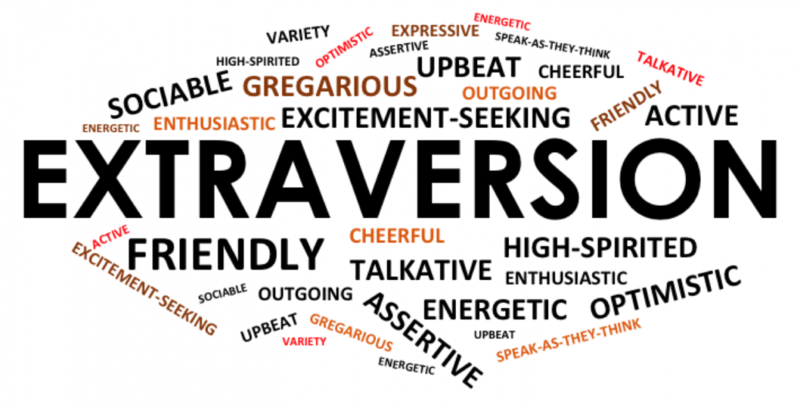 …is probably the best known personality trait and is characterised as the extent to which individuals tend to be: assertive, active, friendly, enthusiastic, energetic, upbeat, optimistic, social, talkative, high spirited and generally outgoing. Extraverts tend to have greater marriage satisfaction, but also higher rates of infidelity. They like to be around people most of the time, they crave excitement and stimulation and tend to be of a cheerful disposition. However, Extraverts don’t cope well with sleep deprivation, think jet-lag, or perform well with tasks requiring a high level of concentration and prolonged vigilance – so auditors and people doing that type of work don’t tend to be high extraverts. In the work place, Extraversion is particularly important to the smooth functioning of social mechanisms within teams, and it is strongly linked to inter/intra-team processes and contextual performance (i.e. unspecified tasks and performance related to the social environment in which teams operate). Intuitively, teams composed of individuals who are warm, friendly and socially adept (highly sociable) should have more effective team interactions, faster problem resolution and higher performance outcomes. Despite the many advantageous behaviours associated with extraverts, the inclusion of many high extroverts in a team is detrimental, because extroverts like to work in teams purely for the opportunities for social interaction it provides them, which can distract attention from goal completion. Their tendency to be endlessly talkative and assertive means that extroverts are dominant, and individuals who are highly dominant and assertive, which are facets of Extraversion, can cause friction and result in teams composed of all leaders and no followers. Dominant individuals elicit less positive interpersonal relations, and are less likely to consider the objectives of their colleagues in group decision making. Having many dominant individuals in a team can result in conflict about a variety of issues, such as leadership and goal agreement. Furthermore, because extraverts have a higher profile compared to introverts, they may be drawn into conflict and be easy targets for negative attitudes, organisational politics, and unproductive behaviour. Further, the negative attributes of high extraverts, i.e. their inability/unwillingness to listen to others, their un-receptiveness to the input of others, etc., degrades their standing as time goes by. This is particularly so in situations where high degrees of interpersonal interaction are required – such as in interdependent working. At a personal level, extremely high extraverts tend to manifest maladjusted behaviours, are more likely to be sexually promiscuous, emotionally intrusive, engage in excessive self-disclosure, thrill-seeking, and have difficulty with substance abuse (possibly due to their elevated reward-seeking tendencies and associations with Dopaminergic Function – which is also why overtly extraverted sales people respond positively to financial incentives and performance related pay). In contrast, individuals who have low levels of extraversion are said to be Introverted, and in comparison with extraverts, are typically described as being more lethargic, inhibited, introspective, reflective, quiet, reserved, serious, private, and they prefer to be alone or in the company of a few close friends. Consequently they have less developed social skills, find it harder to approach and engage others in social interactions, they typically attain lower status in social groups; and, as they tend to find social situations unfulfilling, they avoid them. While Extraversion is related to sociability, this does not mean that Introverts do not value social interactions, or that introverted behaviour is inherently anti-social. Introverts talk as much as Extraverts in one-on-one situations but, as group size increases, more extraverted individuals will spend a disproportionately greater amount of time talking. Extreme introversion is defined by characteristics such as social withdrawal, social detachment, intimacy avoidance, restricted affectivity, anhedonia, anxiety and depression. … reflects kindness, trust, and warmth versus selfishness, distrust, and hostility. Persons high in Agreeableness are considerate, honest, helpful, and supportive, courteous, friendly, tolerant, cooperative, considerate, modest, trustworthy, helpful, altruistic, empathetic, caring; they are typically non-competitive and conflict averse in their social interactions. Agreeableness is highly desirable in Teamwork settings as it positively influences social processes and contextual performance. It has been suggested that Agreeableness may be the best primary predictor of performance where outcomes rely on interpersonal behaviours. Therefore, Agreeableness is highly predictive for tasks involving cooperation and which require smooth relations with others. Compared to the other four traits, Agreeableness may be the most concerned with interpersonal relationships since it predicts social-role behaviours. Consequently, agreeable team members gravitate towards socially-based roles and excel at: interpersonal facilitation, cooperation, conflict resolution, open communication, information seeking, compliance with team goals and goal alignment. Although empirical studies on the relationship between agreeableness and team outcomes have yielded mixed results, they generally conclude that higher levels of Agreeableness lead to higher team performance. In contrast, individuals who are low in agreeableness tend to be direct, uncaring, intolerant, unsympathetic, critical, sceptical, hard-headed, push limits, are openly hostile, and competitive, and are consequently viewed by others as being less socially desirable. While having a team member who is exceptionally high in agreeableness may not have a profound effect on team performance, having a team member who is exceptionally low on agreeableness will likely be disruptive and lead to ineffective performance – hence the “one bad apple” adage. Finally, individuals that are extremely high in agreeableness have been found to be counter-productive to performance outcomes. It is a fact that Agreeableness is not a trait that tends to be in great abundance amongst the ranks of organisational leaders as it can inhibit the tough minded decision making that is required. This has led an increasing number of studies to conclude that “nice guys don’t get ahead and they don’t win”. …is critical to a variety of important life-outcomes, such as: diet, tendency to exercise, health, longevity and mortality risk, academic achievement, professional success, marital stability, earning potential, and even personal wealth. As a trait, Conscientiousness is characterised by the tendency to be self-controlled, responsible, dedicated, hardworking, orderly, and rule abiding. Individuals who are Conscientiousness are: achievement oriented, self-motivated, persevering, hard-working, thorough, orderly, punctual, dependable, responsible, and self-disciplined. They set themselves high standards, strive to achieve their goals, and are well organised. In contrast, individuals who are low in conscientiousness tend to be disorganised, easy-going, and sometimes careless. In a teamwork setting, Conscientiousness combines additively such that the higher the general level of Conscientiousness within the team, the more effectively the team is likely to perform. Even moderate levels of Conscientiousness will result in increased effort and perseverance towards goal achievement, task commitment, cooperation, and adaptability in the face of change. However, Conscientiousness also functions as a supplementary trait, which means that high variations in Conscientiousness between team members (i.e. where some team members are more conscientious than others) results in reduced motivation, conflict, and highly-conscientious team members lowering their effort through a process of Moral Disengagement (i.e. social loafing, shirking, or free riding). Therefore, ensuring that team members are composed of team members that have a similarly high degree of conscientiousness, with little difference between team members, is the optimal condition for higher team performance. The extreme high and low ends of the trait manifest themselves in terms of challenging behaviours, where individuals lack flexibility, readiness and/or willingness to change and accept new ideas. Each is likely to be unacceptable in many if not most work situations. The most extreme cases of high or low Conscientiousness are known to be associated with maladaptive trait related behaviours, including: workaholism, perfectionism, and compulsive behaviour (at the high-conscientiousness end; for example, in the most extreme forms, conscientiousness has been associated with Obsessive-Compulsive Personality Disorder (OCPD)), and laxness, negligence, and irresponsibility (at the low end). … is manifested as a tendency to be secure, calm, self-confident and poised while avoiding excessively negative emotions such as: anxiety, sadness, embarrassment, vulnerability, frustration, anger, hostility, guilt, disgust, depression, the inability to cope with stress, poor impulse control and the propensity to have irrational ideas; each of which are embodiments of the opposite extreme of emotional stability, otherwise referred to as Neuroticism. In a work context, high Emotional Stability is associated with positive interpersonal facilitation and interactions. Consequently, high Emotional Stability contributes positively to teamwork by enabling a relaxed atmosphere that helps to promote stability, coordination, cooperation, and task cohesion, while also reducing conflict, disruptive behaviour. In general, elevated levels of Emotional Stability helps to promote team performance and elevated levels of Neuroticism degrades performance. Neuroticism, the Dark Side of Emotional Stability, is an extremely important trait since is predicts a wide range of negative life-outcomes, such as marital failure, mortality, physical health issues, low stress tolerance and cortisol reactivity, sleep disorders, immune system dysfunction, and many mental health associations. Individuals high in Neuroticism tend to be lonely, moody, hostile, irritable, anxious, nervous, insecure, depressed, and high-strung. Neuroticism has been associated with the negative qualities in relationships and they tend to be affected by the moods of the people around them. Since neurotics believe themselves to be unattractive and are fearful of rejection, they tend to reject others before they are rejected themselves. Highly neurotic individuals (i.e. those with low emotional stability) initially tend to lack status in organisations because the behaviours that typically result from this trait variant, i.e. low self-efficacy, low self-esteem, high anxiety, etc., are perceived negatively and they are associated with low performance expectations. However, in contrast to high extraverts who tend to lose status over time, neurotics actually gain status over time because their naturally high levels of anxiety cause them to be highly engaged in tasks and focussed on goal achievement. Equally, the threat of others perceiving them negatively causes them to put a lot of energy into preparing for and persisting with difficult tasks. This can result in neurotics exceeding the expectations of their peer group and supervisors alike. It is of equal importance to note that extremely high emotional stability also presents as maladaptive personality as the lack of empathy, emotion, and conscience is associated with psychopathy. … is manifested by the tendency to be: intellectually curious, imaginative, creative, adaptable or flexible, all of which may positively impact team performance in the work-place. Openness is the extent to which an individual is: original, sensitive to aesthetics, inquisitive, broadminded, daring, tolerant of ambiguity and uncertainty, independent thinking, and willing to experiment. It’s intuitive to suggest that individuals who are inquisitive when faced with novel situations, adapt to change, and are creative problem solvers, would be high performers in the contemporary workplace. Compared with the other four traits, Openness is a key influence on interpersonal and social interactions, as individuals who are curious and open-minded must have an interest in getting to know others, both inside and outside of their immediate social network. In particular, Openness is thought to be a strong predictor of behaviour when situations are novel or complex, where there is increased likelihood of task-conflict, and where it’s ability to predict performance is contingent upon the outcome. Openness may also help to decrease the rate at which performance degrades over time, and is associated with performance to the extent that individuals high on this trait are more adaptable and responsive to the changes required by the constant state of flux in dynamic team environments. Consequently, ‘open’ individuals should perform more strongly than their less ‘open’ team mates – over the long term. Generalisations can be misleading, but open individuals have been found to have higher levels of job satisfaction in Consulting type environments, whereas less open individuals are more satisfied in manufacturing environments. Teams high in openness tend to develop more creative solutions to problems, consequently, when there are complex problems to be solved, teams should turn to their more open team members. However, it’s not just the average level of openness that matters; the variability in openness within the team also matters. That is, teams made up of individuals both high and low in openness perform better than teams made up of individuals either all high or all low in openness. Despite this, a team that is very high in trait openness might experience greater conflict and low task-cohesion, since the compelling attraction of something new will divert the focus of such individuals from goal completion. conversely, individuals who are very low in openness tend to be down-to-earth, practical, and favour the traditional way of doing things, but they also tend to be very set in their ways. Any questions or suggestions? Feel free to DM or comment below.